I think my favorite thing about Minnesota winters is that it is perfectly acceptable to take a hot bath every. single. night because it is so darn cold outside and the need to get warm to the bone is real! I LOVE taking hot baths and one thing I MUST have in every bath is some sort of bath salts. 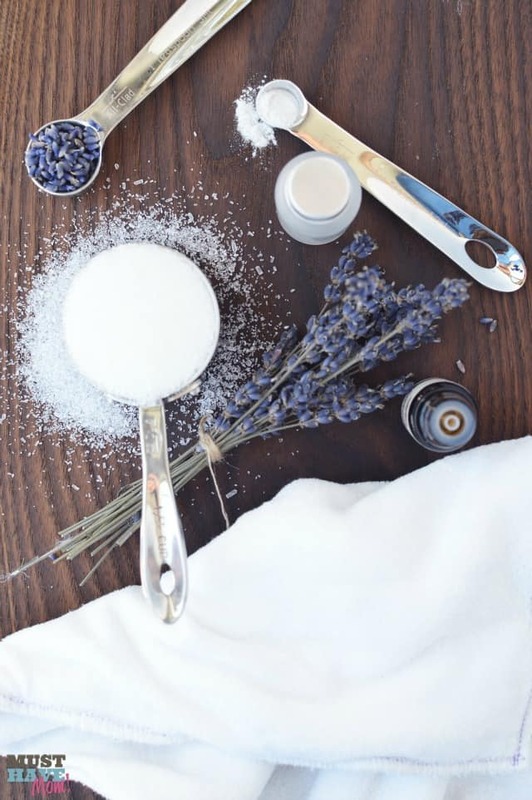 I have been making my own bath salt recipe variations for years and they take my baths to the next level and really give a spa experience in the comfort of my own home (without the spa price tag!). 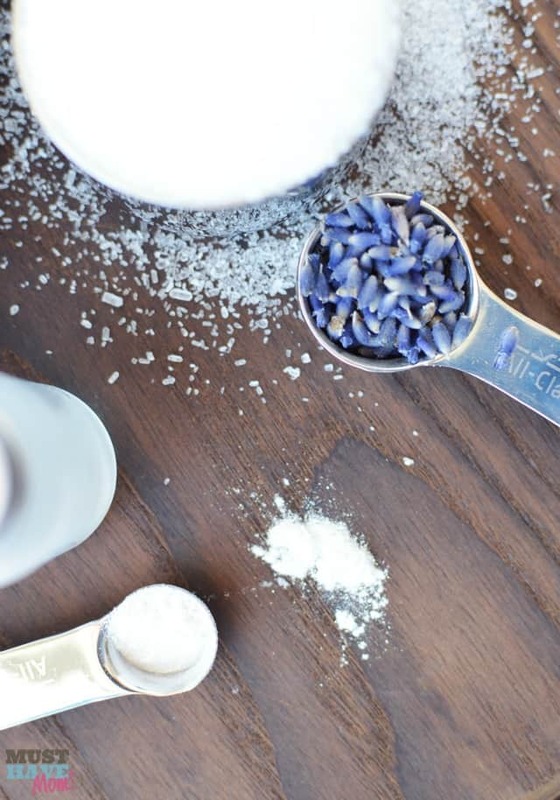 This DIY shimmery lavender bath salt recipe is just what you need to wind down after a busy day and crawl into bed ready to drift off to dreamland. 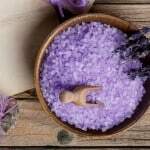 The lavender helps you relax and get sleepy so there will be no laying awake in bed after your bath wishing you were sleeping. You’ll need a few ingredients to make this and the best part is that you can make a big batch ahead of time and store it so you always have some on hand. 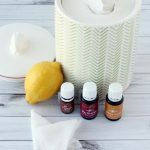 It also makes an amazing DIY gift idea for someone who shares your love of hot baths and relaxation! The final product is so pretty and perfect for gifting in pretty glass jars ! 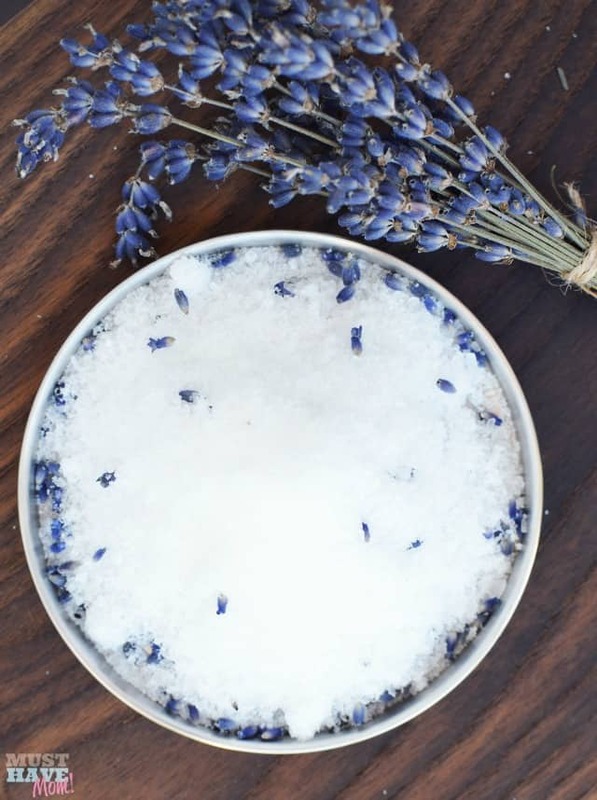 Combine 1/3 cup epsom salt , 1 tablespoon dried Lavender Flower , a few drops of lavender essential oil, and ¼ teaspoon shimmery mica powder (adds a lux spa feel but is optional) all together in a small bowl and cover until ready to use. Add to a hot bath and soak for at least 20 minutes. This will allow your muscles to relax and reduce stress and tension in your body. Tip: if you or a friend happen to grow lavender in the garden, save the flower stems! I did this for the first time last summer and have been so happy. It took only a few minutes to tie bunches together, cut and dry. So far they have lasted perfectly, especially the coloring, and smell just as amazing as they did while growing. You can print off the recipe below! 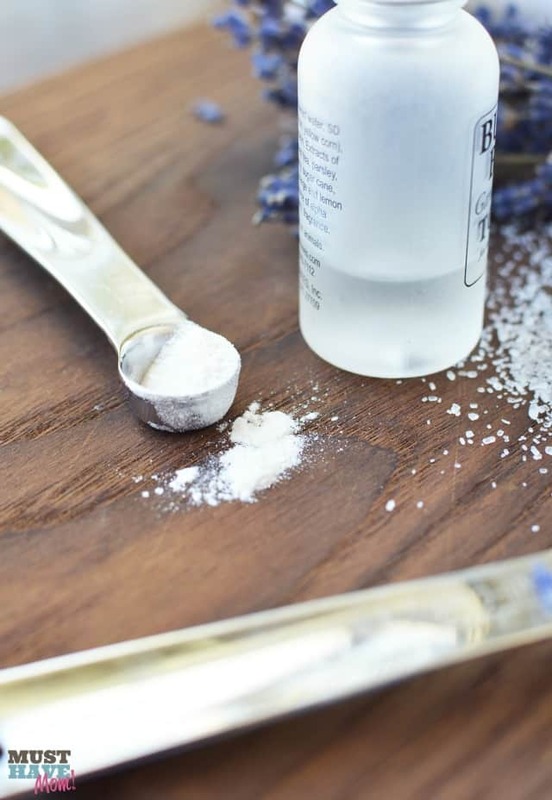 Be sure to pin this bath salt recipe for easy finding later and share it on Facebook! 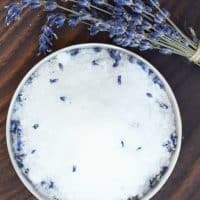 Easy DIY bath salt recipe that will deliver a spa experience at home! Doubles as a great DIY gift idea! Combine the ingredients all together in a small bowl and cover until ready to use. Add to a hot bath and soak for at least 20 minutes. This will allow your muscles to relax and reduce stress and tension in your body. I could use this right about now. A nice bath with some bath salt would be nice. 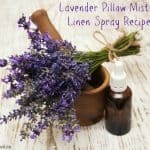 I think lavender is great for relaxing too. I’ll have to make this soon. It is perfect after a long day when you just want to relax and then climb into bed. I have super sensitive skin so using products that are as natural as possible is a must. 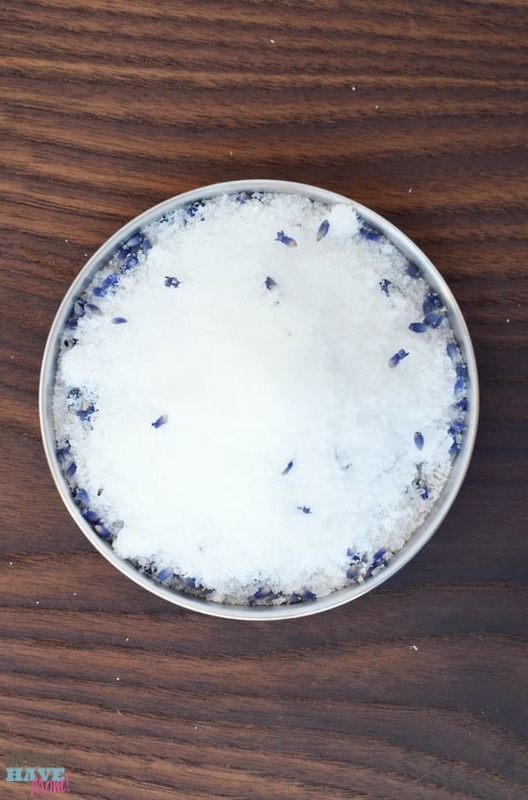 This bath salt looks amazing and I love the smell of lavender! 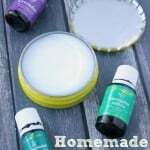 You can’t get any better for knowing what is in your bath products than making it yourself. Just looking at your photos make me want to take a bath with fresh lavendar and salt right now. I can even imagine how good this would smell. It is amazing. Make some and enjoy your bath. Ohhh, I bet this smells absolutely amazing! 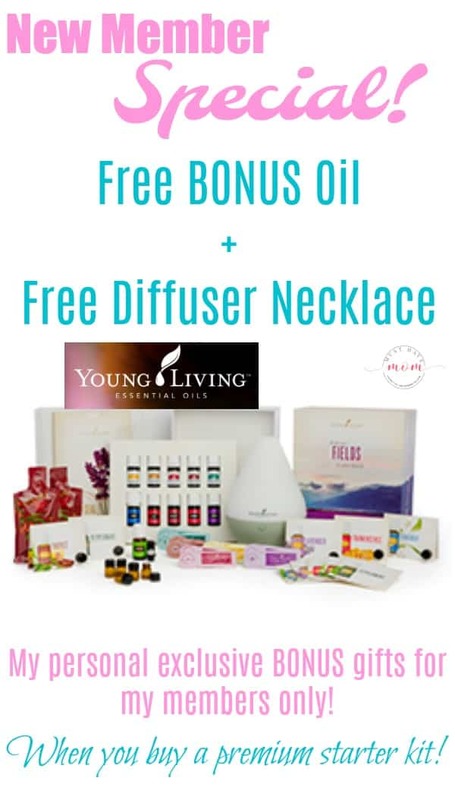 I am just now getting into essential oils! Thanks for the recipe and for linking up to Merry Monday! Pinned & Sharing on G+! Have a great week!